Jan 20th /89 Sunday Much same temperature with light snow most A.M. some sunshine P.M. As well with our folks, think & El- at service & s-school as usual, but children not out. After poor nights rest weak & poorly self, & of course at rest with naps & reading as usual. Jan 21st /89 Monday. Pleasant colder morn tho' only 4° below & at 25° P.M. Much same with our folks, & busy as ever at usual duties. Ch- at home all day as usual. El- rec'd letter telling of Aunt Lizzie Hancocks death Dec 16th. Rather better self, tho' quite nervous after reading clippings & arranging for scrap book. 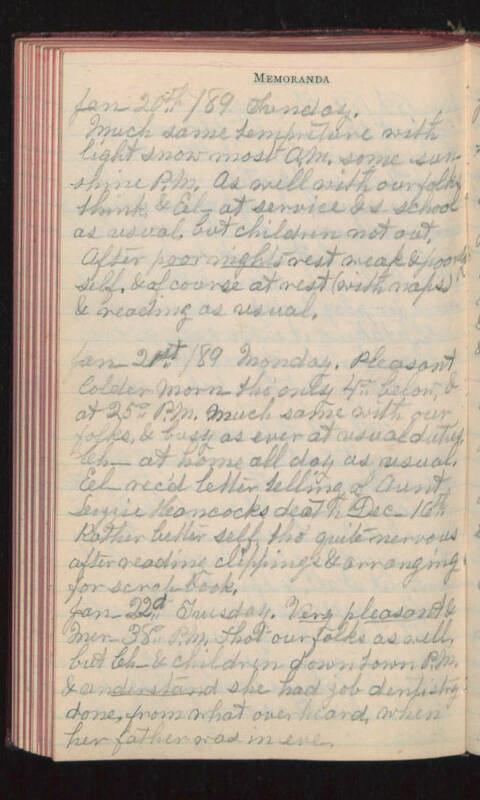 Jan 22d Tuesday - Very pleasant & Mer 38° P.M. tho't our folks as well, but Ch- & children down town P.M. & understand she had job dentistry done, from what over heard, when her father was in eve.